Make it a day they will remember with one of our Graffiti Art Parties, perfect for young teenagers that want a party activity that will get their friends talking back at school! 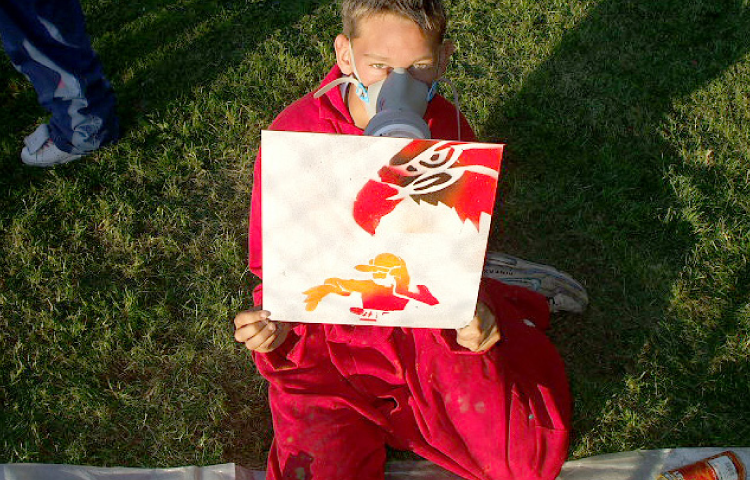 Using spray cans, stencils young people will create a piece of unique street art. Our host graffiti artist will show them all the basic techniques and a few special tricks to help them bring out their creativity. The results make great wall hangings. Everyone goes home with two graffiti boards that they have created & the birthday girl/boy will have a keep sake special birthday board made for them by the host artist and signed by all the guests. Creating unique master pieces is the aim of all graffiti artists, our workshops aim to give groups the chance to experience this thrill. You decided subject of the piece or the artist will work up an idea with the group and all those that attended will get to sign their artwork. Pieces can be produced to any size from one 8 x 4 foot (2.4 x 1.2m) plywood board to any number of boards joined together, this can then be wall mounted. Pieces can also be painted directly onto walls, buildings shutters etc. We have many years’ experience in presenting graffiti & street art workshops that are fun while still adhering to rigorous health and safety standards. Using non-toxic fabric paints & stencils instead of spray can mean this is the perfect indoor activity for the cool creative kids. The host graffiti artist will show the young people how they can use colours and effects to personalise their t shirts, perfect for the young Banksy or budding artist in the family. Everyone goes home with a high quality t shirt and the birthday girl/boy get a special birthday keep sake t shirt made for them by the host artist and signed by all the guests!